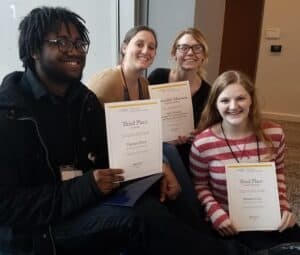 William Peace University Communication students won multiple awards for their exemplary work for the University’s student publication, The Peace Times, at the 2019 North Carolina College Media Association (NCCMA) conference. Breanna Cary, Alexandra Garrison, Mary Kubeny, Damian Perry, and Caitlin Richards won multiple awards for their work as feature writers and cartoonists for The Peace Times. WPU students competed against students from more than a dozen other universities across North Carolina, while also networking and learning best practices for student publications. Students attended the conference with Assistant Professor of Communication, Marti MaGuire, who also served as a contest judge. (From left to right) Damian Perry, Alexandra Garrison, Mary Kubeny, and Breanna Cary with their NCCMA awards. The conference was held at North Carolina A&T State University, where WPU students had the opportunity to tour student media facilities and attend a variety of sessions on topics such as visual storytelling, food writing, covering diverse communities, investigative journalism and more. Conference speaker panels were led by professional journalists, professors, and nonprofit leaders. As part of a conference workshop, WPU’s student newspaper, The Peace Times, was critiqued, providing valuable feedback on how to improve the paper’s content and design. The NCCMA Conference serves to engage and encourage student media operations across the campuses of North Carolina. The one-day conference is held at a different campus each year and features information sessions with professional panelists who work in the realm of journalism and similar sectors. Guest speakers give thoughtful critiques on how students and university representatives can improve their media efforts for their respective institutions. For WPU students, attending conferences like the NCCMA not only provides a valuable learning opportunity, but also gives students the chance to sharpen their networking skills and connect with students from other institutions who share similar interests in the field of journalism. The Peace Times gives student contributors the opportunity to learn as they create written and visual content for the WPU community. And with their success at this year’s NCCMA, it’s a safe bet that the staff is ready to put together submissions for next year’s conference. This was WPU’s second appearance at the NCCMA conference, which was held at North Carolina A&T State University.